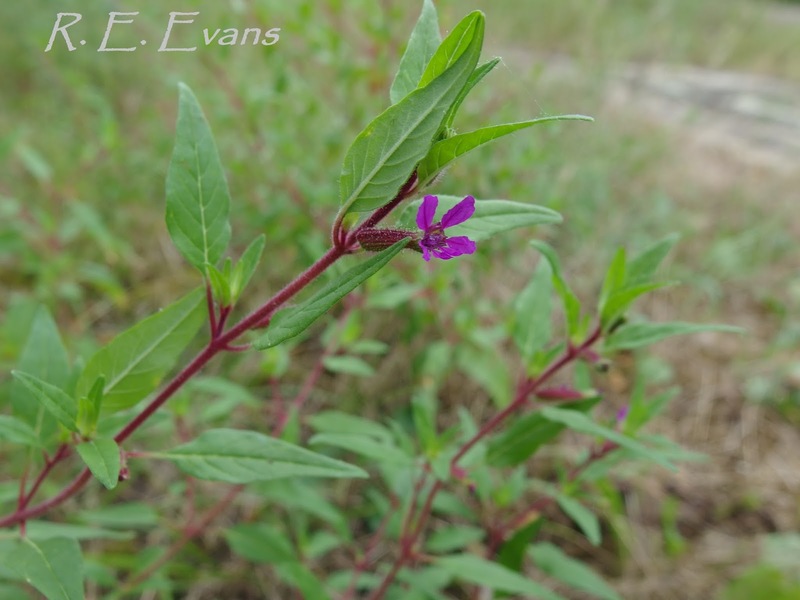 Blue Waxweed or Clammy Cuphea (Cuphea viscosissima) is infrequently encountered in North Carolina. It has been reported from the northern mountains, southern mountains, and northern Piedmont - perhaps it is overlooked and unreported at stations in between? The species is widely distributed in neighboring states to the north and west, but is apparently most common in Missouri and southern Illinois. One of the most interesting traits of Blue Waxweed is the abundance of sticky hairs (shown above) which are thought to serve as defense against insect pests. Several years ago I noticed this adaptation in action. 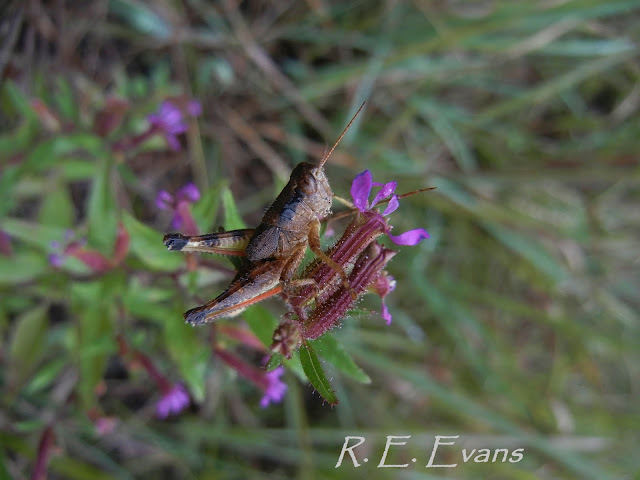 A grasshopper had landed on a Cuphea stem presumably to feed but ended up stuck by its front and hind legs (see below). At the time, the grasshopper was alive and well. Perhaps it would have eaten its way free, or perhaps eventually succumbed? Either way, evolution was thwarted when I felt a bout of compassion and flicked the grasshopper free. Plant conservationists are often expected to justify saving native plants, with the implication that each species must stand on merits that we can measure. To many, an otherwise obscure and insignificant species (like Blue Waxweed) only really "matters" if it holds the cure for cancer, or provides some other potential human benefit. When the utilitarian argument is needed it comes in handy to have a couple local, supporting examples. Blue Waxweed serves admirably. 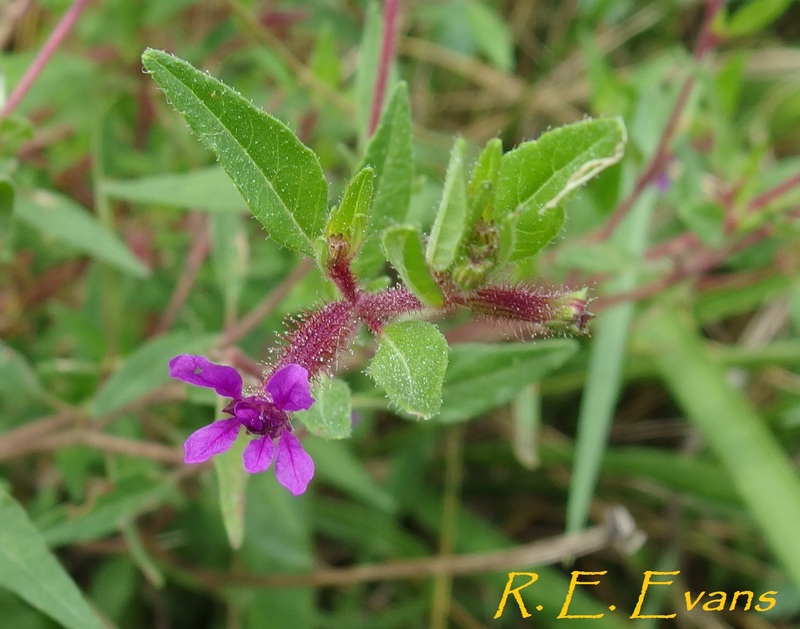 Unexpectedly, Cuphea viscosissima produces some of the highest concentrations of capric acid among herbaceous plants (1). Also known as a medium chain triglyceride, this type of "goat smelling" fatty acid has several commercial and industrial uses whose demand is growing exponentially worldwide. However, current supply comes almost exclusively from oil palms and coconut, creating a virtual "tropical oilseed monopoly" (2). Consequently, Blue Waxweed has been under consideration for massive production. One estimate suggests that 2.7 million hectares of Cuphea fields could supply North America and Europe's demand. I can only imagine!